Unplugged and Off-the-Grid ~ Exploring by Canoe (Part 4) – Travel. Garden. Eat. 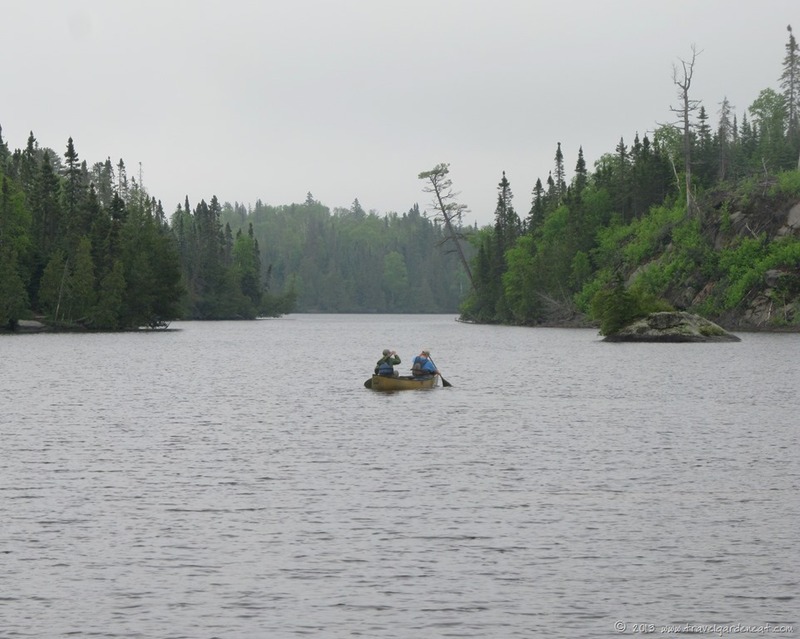 The weather was gray and wet, and often windier than one would like for taking the canoe out for a relaxing exploratory paddle of the surrounding lakes. And there is something to be said for just enjoying the beautiful spot where you’ve set up camp, and kicking back with that good book or fishing rod in hand. 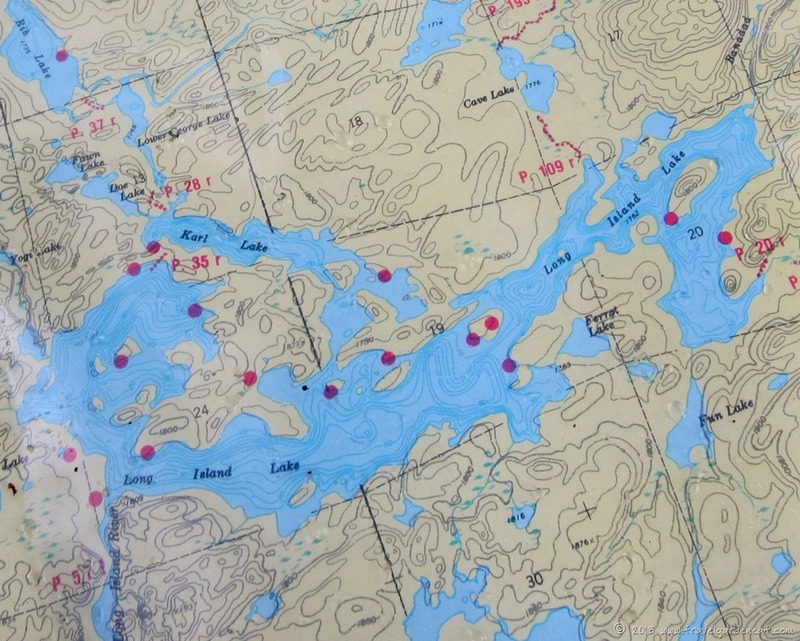 We did set out one day to explore the nooks and crannies of Long Island Lake. The boys set off on their own, map and compass in hand. I thought about the fact that as parents we are so used to having that electronic tether to our children now — the cell phone that provides the ability to send off a quick text to say, “I made it safely” or “We decided to head to the beach and then I’ll be home.” While it provides much comfort when children begin their solo outings and begin traveling farther afield, it is so important as a parent to have the ability to let your child spread their wings without that leash attached. 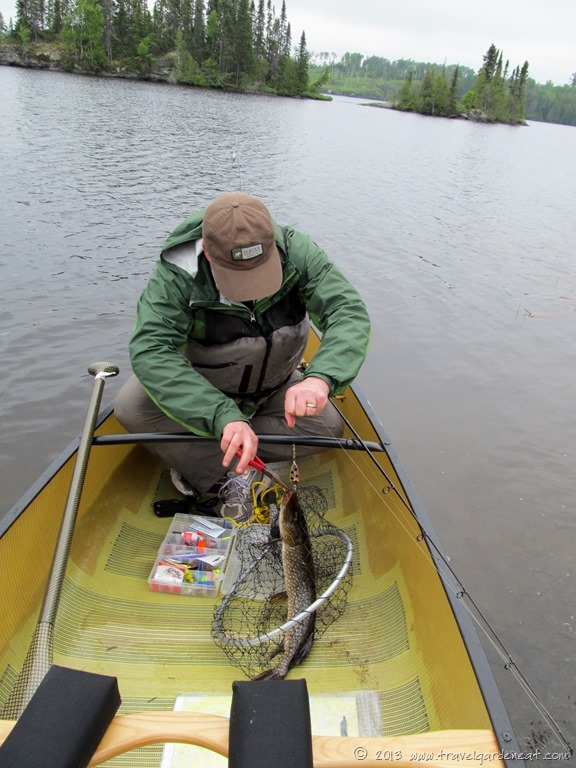 My husband and I headed out on the lake later in the day, and had a bit more luck with fishing, landing a northern pike. Northerns can be tricky to filet and quite bony to eat, so we ultimately decided to throw him back and let him swim to see another day (particularly since the hoped-for shore lunch fish fry was going to be a bit sparse with only one fish to share among the four of us). We spotted a canoe or two in the distance, and paddled by an occupied campsite, but otherwise had the lake to ourselves. 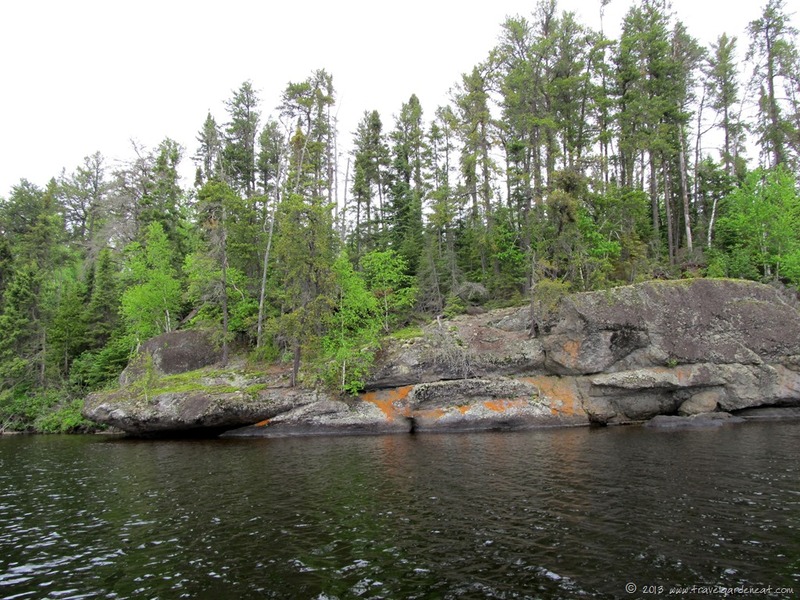 That is the magic of the Boundary Waters. In northern Minnesota, we are fortunate to see American bald eagles on a routine basis. I always feel a sense of awe when I see one perched in a tree, sitting in its enormous nest, or soaring above in the open sky, no matter how often I see this majestic bird. A pair of eagles must have been nesting nearby, as the boys saw the two of them perched in this dead tree along the shore, but by the time we paddled close to it, only one remained. Frequently during our stay on Long Island Lake we would see one or both of the eagles perched in one of the burned out trees from a fire several years ago, or flying low over the lake looking for their next meal. With weather uncertain, we turned back for “home”, paddling at a leisurely pace. We had the evening ahead, watching the loons and the eagles, enjoying the solitude. Thanks for taking time to read and comment, Lori! That’s so nice that the boys are old enough to go off on their own with a map and compass. I love canoe fishing. I’ve only had the opportunity to do so once in Canada, and it was just as you describe. I didn’t appreciate having to portage with the canoe, but everything else was wonderful. Love your photos, Kat. They are refreshing to see as we head for another 90-degree day. It is a hot one for us here today, as well! But we must not complain after the lack of spring and lost summer month of June we endured! Love this Kat! I really need to do a real BWCA trip. I’ve only been to Eagle Mountain to hike it but never truly inside. So incredibly beautiful! How many days were you there? Ever see a bear or mouse? We saw a chipmunk 🙂 — no bear, and the only moose we saw was a mom and baby feeding in a swamp as we drove to our entry point, although that is still a special sighting, but not while on the waters. Due to busy teen schedules, work schedules, etc. we only were on the water for 3 nights with one additional night at the outfitters (Hungry Jack Outfitters — they were great!) the night before. We frequently “car camped” as the boys grew up (State Parks, etc. tent camping but having car with gear parked at the site, so we did not have all the lighter weight and smaller sized camping equipment that is essential for a comfortable BWCA trip). 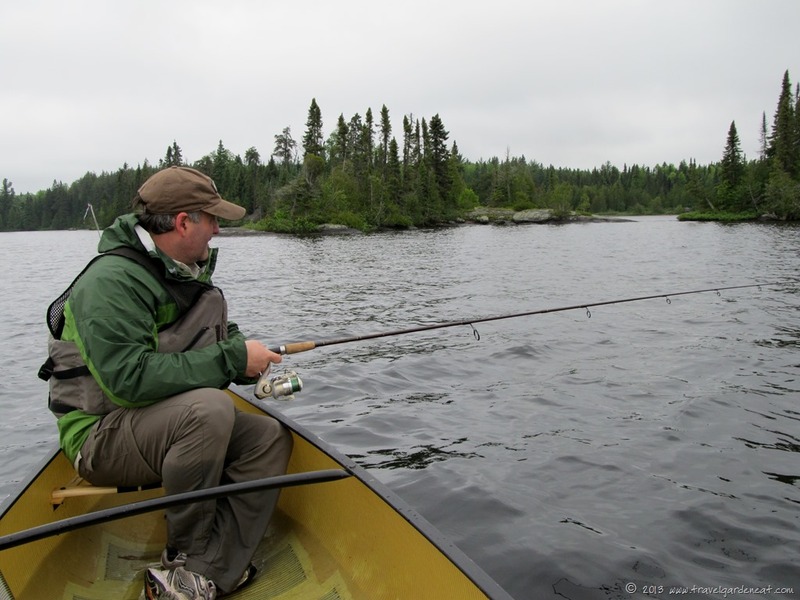 I hope I have a chance for another BWCA experience soon. I highly recommend it! Thanks Kat! Would love it. My dad and brother used to go all the time for a week and one time they were about a day out into the trip and slept on a small island. A bear swam across and right before their eyes climbed the tree and ate every single piece of food they had including the peanut butter in the jar! My dad and brother had to canoe back for a day with no food! Their trip was ruined but a great memory!!! Someday I’ll get there! Don’t know how I could do the portaging though as my back isn’t the best for carrying heavy weight. Glad a bear didn’t swim to our small island, as we could not find a good food bag tree so it was suspended just high enough to act like a bear pinata, if a bear had happened to come along! It was some great family time. How did I not know that BWCA is adjacent to Quetico?! Gorgeous part of the country (countries) and your pics do it justice! 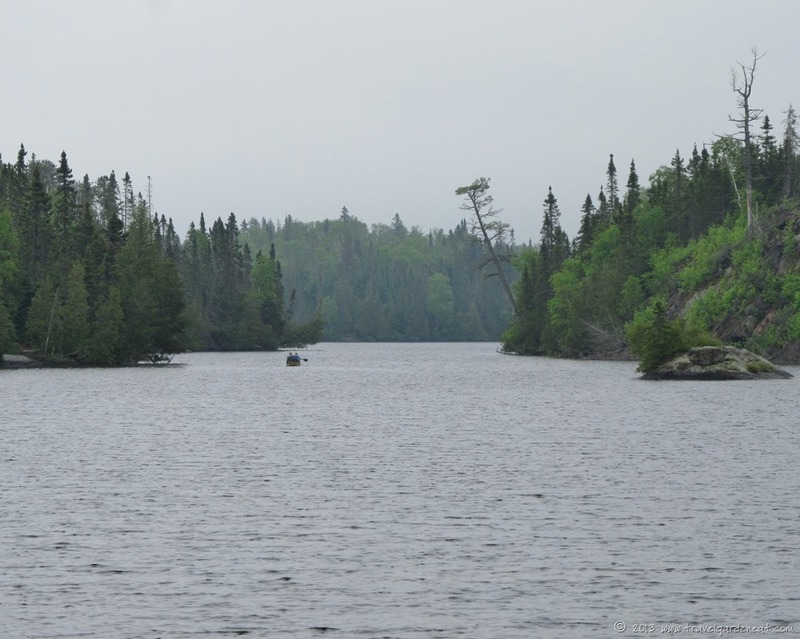 The Quetico/BWCA is amazing — thanks so much. The weather added a layer of gray to the images, but the beauty and peaceful vibe of the area still comes through. Pingback: Unplugged and Off-the-Grid ~ A Change of Scenery (Part 6) | Travel. Garden. Eat. Another beautiful post Kat. I know i am reading this backwards, but I feel I am there with you! Those bald eagles are gorgeous….never seen one in the wild either. 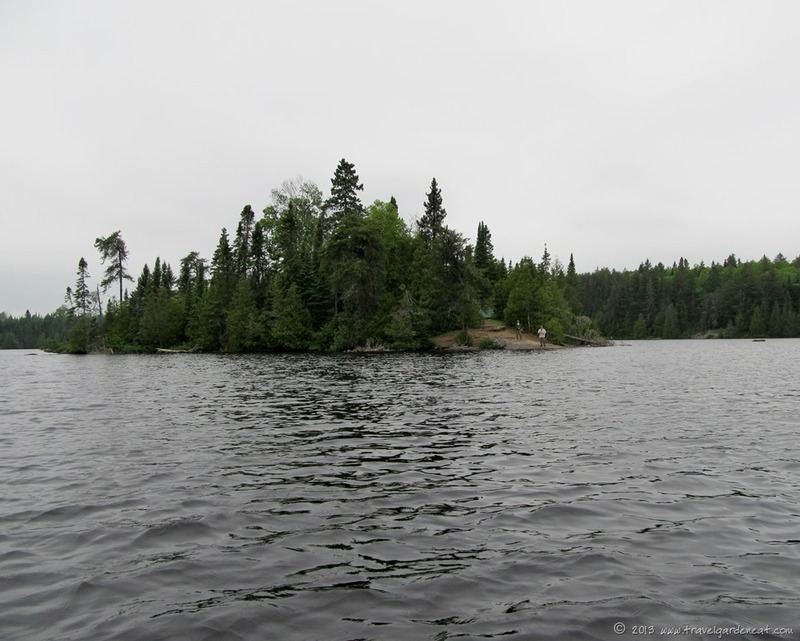 Pingback: Unplugged and Off-the-Grid ~ Our Island Home (Part 3) | Travel. Garden. Eat.